it is the day of the longest night, and so it seems fitting, it does, that this be the day we remember the birds and the little beasts that dart and that frolic out in the not-so-wild of our leafy backyards. for years now, feeding the birds for christmas has been one of the quaintest moments on my calendar. alone in my kitchen, or with little hands weighing in from the wings, i plop out the peanut butter, smear on the cones, roll in the seed, tie with a string. sometimes i swear that patron saint of wild things, st. francis, that is, is there too, peeking over my shoulder, leading me on in this sacred creation. feeding the little winged things. making a tree for the birds just out my window. i have searched high and low, looking and asking, isn’t there a particular one day of the year, somewhere in the world, set aside for this cutting out bread hearts, rolling peanut-butter pine cones, all in the name of returning the birds’ favor? so far, i’ve not found a day, so i am declaring it this one, the day of the long winter’s night. the day of the solstice. so if you or your little ones might be so inspired, what you need, simply, is this: a stash of pine cones, slices of bread, a jar of good peanut butter, a tinplate of seeds. should you care to make a haute tree, ask your friend the butcher for a paper-wrapped packet of suet, a.k.a. the fat sliced off a good chunk of cow. if you go the suet route, you might want an old pot, for pity the poor soul who warms up his soup in the pot that last melted the suet. have at it. cookie cutters make fine shapes of the bread, which then can be smeared in pb&j fashion. 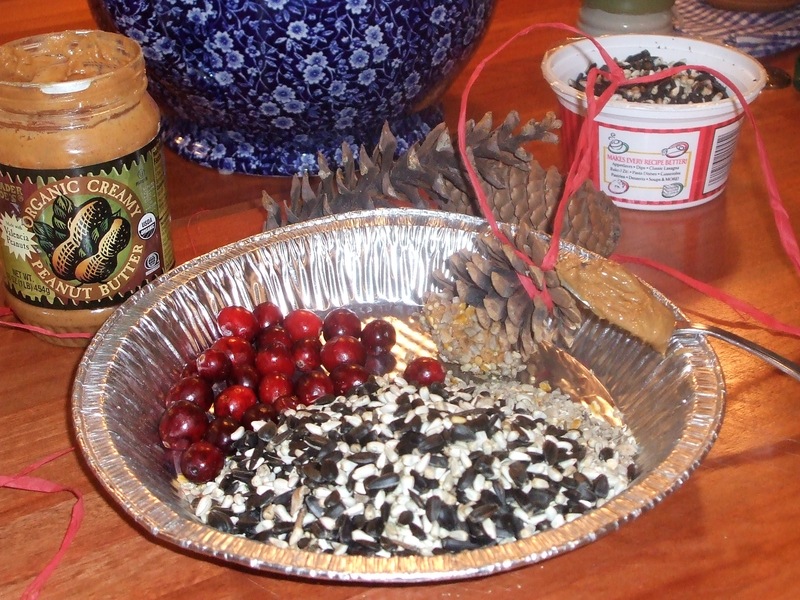 dunk in your seed pile, thread through a string, and, voila, my friend, you have a treat for your bird. pine cones are a variation on that same winged theme. to make a suet cake, melt the fat, pour into muffin tins, add seed to thicken the plot, stand back and let harden. you might want to have left a once-knotted string or a raffia in the cup before hardening, or simply thread through after the fact. it’s all very simple, and that is the point. it is the simple act of loving God’s creatures, saying thanks for the delight they bring to your heart, that makes it so magic. that, and knowing as you settle your head for the longest night’s sleep that you warmed the belly of the great winged flock. and most likely, the heart of the one who first gave flight to those feathers. bless you and yours this long winter’s night.